The workshop seeks to bring together researchers in various fields that involve Maxwell's equations and related topics. The recent substantial growth of applications of optical science and electromagnetics has driven the need for mathematical models, analytic techniques, and numerical algorithms. A main focus of the workshop is to offer a comfortable and spirited gathering to promote exchange of ideas, to present significant findings, and to discuss future directions. The conference will be held at Shandong University Academic Center in Weihai. National Basic Research Program "High Performance Scientific Computation Research"
A volume based on this conference will be published. The conference will be held during July 24-28, 2006. July 23 is the arrival day and July 29 is the departure day. A limited number of rooms have been reserved for the conference at the Golden Bay Hotel (with a conference special rate RMB 650 per day). Additional rooms have also been reserved at the Shandong University Academic Center (Weihai) at a special rate of RMB 360 per day. Please contact zwq@lsec.cc.ac.cn for room reservations. 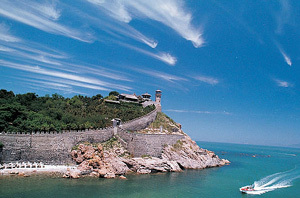 All registered participants are invited to a sightseeing tour of a historical town near Weihai on July 28. There is a regional airport in Weihai. Transfers may be made at the International airports of Beijing, Shanghai, or Hong Kong . Please contact zwq@lsec.cc.ac.cn if additional help is needed. .
A registration fee of 800RMB for domestic participants (400RMB for students) and 200USD for foreign participants will be charged upon the arrival of the conference. 2 The local travel information will be available by June 30, 2006. Please e-mail your enquiries to Ms. Wenqiong Zhang (zwq@lsec.cc.ac.cn).